Wireless LANs provide high-speed data within a small region, eg.a campus or small building. Wireless devices that access these LANs are typically stationary or moving at pedestrian speeds. 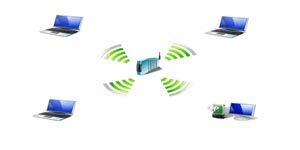 Wireless LANs can have either a star architecture, with wireless access points or hubs placed throughout the coverage region, or a peer-to-peer architecture, where the wireless terminals self-configure into a network. The first generation wireless LANs were based on the proprietary and incompatible protocols .Most operated within the 26MHz spectrum of the 900MHz ISM band using direct sequence spread spectrum, with data rates on the order of 1-2Mbps.Both star and peer-to-peer architectures were used. The second generation of wireless LANs operate with 80MHz of spectrum in the 2.4GHz ISM band. The standard specifies direct sequence spread spectrum with data rates of around 1.6Mbps and range approximately 150m.The network architecture either star or peer-to-peer. In Europe wireless LAN development revolves around the HIPERLAN (high performance radio LAN) standards. The first HIPERLAN standard, HIPERLAN type 1, with data rates of 20Mbps at a range of 50m.This system operates in a 5GHz band similar to the U-NII band. Its network architecture is peer-to-peer. The next generation of HIPERLAN, HIPERLAN Type2, is still under development, but the goal is to provide data rates on the order of 54 Mbps with similar range, and also to support access to cellular, ATM, and IP networks.